This is Mouse, the newest member of our family. 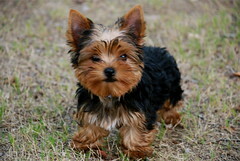 He's a twelve-week-old Yorkshire Terrier. My wife says I've been beaming with a smile ever since I first held him. After using with the single-button mouse for a almost a month, I've switched to the Microsoft Wireless IntelliMouse Explorer. I've concluded that the single-button mouse is obsolete, and it is just arrogance and stubbornness that cause Apple to stick with it.